I came across a useful plant called Azolla, & figured maybe a thread documenting plants that would be useful for the aftertime would be a good idea. Azolla is a fern that grows in stagnant or slow-moving water. Like duckweed; except unlike duckweed, it will grow in the shade.This makes it a perfect plant for the aftertime. Optimal growing temperatures are from 18 to 28 C (64 to 82 F). It can survive temperatures of upto 45 C (113 F) and -5 C (23 F). During winters in the aftertime, a makeshift greenhouse can provide year round production of this plant. The plant can be cultivated in compost tea. They will also live in water with fish or ducks, recycling their excrements. -It doubles in size in 4 days. -It doesnt need soil. It fixes nitrogen like legumes. So excess growth can be mixed in the compost, or directly used as a top dressing in the garden. -It feeds fish, chicken & cattle, etc. Due to low fibre content, the nutrients are easily abosrbed. -Improves milk production and health of livestock. An instance of growing Azolla in vertically stacked trays, to maximize space. 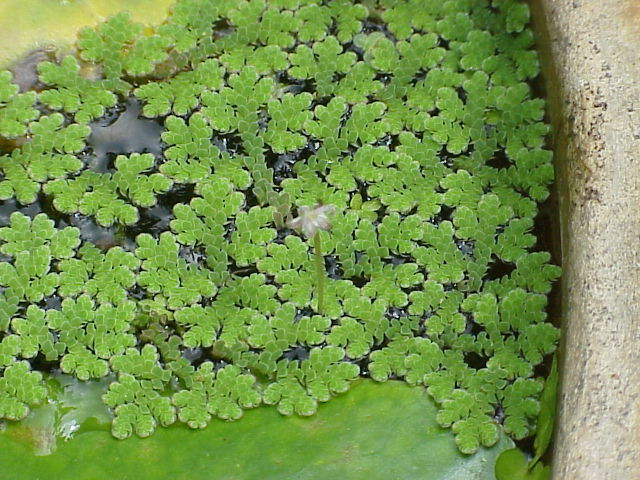 Examples of Azolla grown with Tilapia. In both instances, the fish feed on the azolla, & the azolla feed on the decomposing fish poop. The rain aerates the tank sufficiently. Azolla are good accumulators of heavy metals. But since fish dont accumulate lead, this is a good setup to have in the aftertime. If grown for humans or animals they should be grown out of the aftertime rain, under some netting or plastic coveralls. Why not grow azolla instead of having our crops barely make it through? In some parts of the world, growing azolla and tilapia/trout can be a year round production. Some makeshift fish tanks is all you need. During winter, you can grow a few baby tilapia indoors, and grow them back in spring. Even without fish, you can grow azolla with worm compost. In a semi-indoor greenhouse, this can be year round high quality food for you and your livestock. If you know of other versatile plants for the aftertime, please feel free to add on to this. Chickweed: contains high amounts of vitamin C, as well as vitamins A, D and B.
Dandelions: Dandelions are packed with essential minerals such as iron, potassium and beta-carotene and vitamins A, C and D.
Stinging Nettle: contain high amounts of vitamins A, B and C, as well as calcium, magnesium, potassium and zinc. Two other weeds that should fare well in the temperates. They grow in moist soil and do very well in shades. Garlic Mustard: high in vitamin A & C. First year leaves remain green through winter; providing a source of vitamin C ( in case pine trees arent around). They dont grow in dry areas, and are an invasive species like Kudzu. Miner's Lettuce: cool weather weed. rich in vitamin C.
pesky weed that thrives in the shade. It is used in Asian cuisine. The variegated variety is sometimes landscaped into gardens. It reverts back to the all green vareity and becomes a weed. They spread out mainly through their roots. 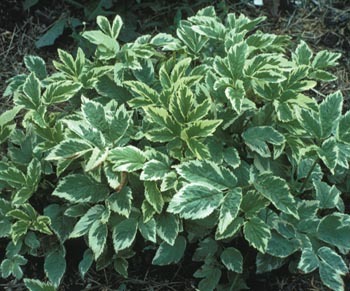 Goutweed containts vitamin C, vitamin A, calcium, magnesium & potassium. Also, goutweed has opposite groups of leaves (left), while poison ivy has alternate sets of leaves (right). A pdf to help identify poison ivy. Another invasive species that tolerates the shade & can be eaten like asparagus or rhubarb. Malabar Spinach is a great food source now and then. It grows in sun and shade. In the shade the leaves are larger. I use the leaves like tortillas, simmer for a couple minute and put cheese, veggies, shrimp, whatever. And it reseeds itself, or you can also save the seed to start in the spring. Wild Mustards are found all over the world like dandelions are. There are all kinds of varieities. Yellow Rocket, Land Cress, Brown Mustard, Shepard's Purse, etc. There are too many to list them all. Plants For A Future is an excellent tool to find out about any plant. Type in "Brassica" into their search bar, and you can get an idea of the types of varieties that exist. 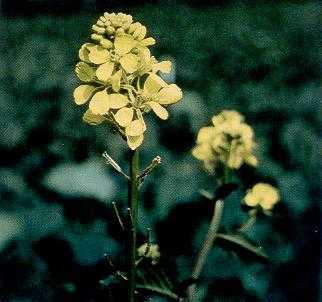 A much easier alternative is to grab a book on edible weeds from the library, and find out what kind of "mustards/cress" are prevalent in your locale. All mustards have the early set of leaves arranged in a basal rossette. The younger leaves are lobed for most kinds. The flowers are mostly yellow and sometimes white. But they always have 4 petals only. flowering stems can be cooked as well. Anything "peppery" is excellent for coughs, throat infections, etc. Tea made from ground seeds would be great for such cases. wiki says malabar spinach does good in humid (aftertime) climates & is nutritious as well. Funny thing is I think Ive eaten this plant when I was little. Common mallow (highly nutritious) can be mistaken for Ground Ivy. Ground Ivy is in the mint family, which there are several wild varieties of. Nevertheless, they are both edible (& found around the world). Wood Sorrel is another low ground cover weed. Internet reports suggest to eat sparingly due to high oxalic content. Consume moderately with a varied diet. It was used to treat fevers and vitamin c deficiency. Sheep sorrel & curly dock are another two shade tolerant edibles. Curly Dock (or Yellow Dock; Buckwheat family) “became an important vegetable during the Great Depression, when people were hungry”. -Leaves are high in vit. A & C.
Older leaves are cooked like spinach. Seeds can be harvested and be made flour or porridge out of. Leaving the chaff on can make the flour or grain bitter. If making a porridge, soak the grains in multiple batches of cold water. Step 1: [In an oven], spread the grain in a single layer and place under the broiler on the highest rack. Every minute or so pull the skillet out and stir the grain. After about 5 minute...the hulls should be very dry. Step 2: Rub grain on top of a screen. Note: It is toxic to horses, cattle, sheep, poultry. The leaves & roots can have a gentle laxative effect on some. Native Americans & asian indians used the ground root powder to clean teeth. For those in the eastern U.S. planning to utilize kudzu foliage & roots, under shady conditions the leaves may look paler & smaller. Kudzu stems are hairy, poison ivy stems are smooth. First-year roots and second-year stems can be cooked by boiling for about 20 minutes...Young leaves & roots are eaten in Japan. Once planted, they're there to stay. The roots of both these plants contain inulin; which can result in some flatulence.